Scarlet fever is a rash that complicates a bacterial throat infection called strep throat . Scarlet fever, also known as scarlatina, gets its name from the fact that the patient's skin, especially on the cheeks, is flushed. The disease primarily affects children. A sore throat and a raised, sandpaper-like rash over much of the body are accompanied by fever and sluggishness (lethargy). The fever usually subsides within a few days, and recovery is complete by two weeks. After the fever is gone, the skin on the face and body flakes; the skin on the palms of the hands and soles of the feet peels more dramatically. Treatment for scarlet fever is intended to offset the possibility of serious complications such as rheumatic fever (a heart disease) or kidney inflammation (glomerulonephritis) can develop. Scarlet fever is highly contagious and is spread by sneezing, coughing, or direct contact. The incubation period is three to five days, with symptoms usually beginning on the second day of the disease and lasting from four to ten days. Early in the twentieth century, severe scarlet fever epidemics were common. In the early 2000s, the disease is rare. Antibiotics have helped, and it is possible that the strain of bacteria that causes scarlet fever has become weaker with time. Scarlet fever primarily affects children between the ages of five and 15 years. Approximately 10 percent of all children who have strep throat develop the characteristic scarlet fever rash. Scarlet fever is caused by group A streptococcal bacteria ( S. pyogenes ), highly toxic microbes that can also cause strep throat, wound or skin infections, pneumonia , and serious kidney infections. The group A streptococci are hemolytic bacteria, which means that they have the ability to break red blood cells. The strain of streptococcus that causes scarlet fever, unlike the one that causes most strep throats, produces an erythrogenic toxin, which causes the skin to flush. The doctor will take note of the signs and symptoms to eliminate the possibility of other diseases. 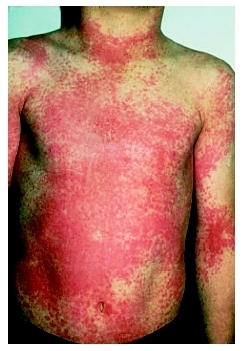 For example, scarlet fever can be distinguished from measles , a viral infection that is also associated with a fever and rash, by the quality of the rash, the presence of a sore throat in scarlet fever, and the absence of the severe eye inflammation and severe runny nose that usually accompany measles. Although scarlet fever often clears up spontaneously within a few days, antibiotic treatment with either oral or injectable penicillin is usually recommended to reduce the severity of symptoms, prevent complications, and prevent spread to others. Antibiotic treatment shortens the course of the illness in small children but may not do so in adolescents or adults. Nevertheless, treatment with antibiotics is important to prevent complications. One benzathine penicillin injection is required for treatment. But since penicillin injections are painful, oral penicillin may be preferable. If the patient is unable to tolerate penicillin, alternative antibiotics such as erythromycin or clindamycin may be used. However, the entire course of antibiotics, usually ten days, needs to be followed for the therapy to be effective. Because symptoms subside quickly, there is a temptation to stop therapy prematurely. It is important to take all of the pills in order to kill the bacteria. Not completing the course of therapy increases the risk of developing rheumatic fever and kidney inflammation. Scarlet fever is characterized by a sandpaper-like rash on reddened skin. Bed rest is not necessary, nor is isolation of the patient. Acetaminophen may be given for fever or relief of pain . If treated promptly with antibiotics, full recovery is expected. Once a patient has had scarlet fever, the person develops immunity and cannot develop it again. Avoiding exposure to children who have the disease helps prevent the spread of scarlet fever. The most important thing to do for children with scarlet fever is to carefully and completely follow the healthcare provider's instructions for administering a course of antibiotics. See also Strep throat . Balentine, Jerry. "Scarlet Fever." eMedicine , November 2, 2004. Available online at http://www.emedicine.com/emerg/topic518.htm (accessed December 30, 2004). Goldenring, John. "Scarlet Fever." MedlinePlus , November 11, 2003. Available online at http://www.nlm.nih.gov/medlineplus/ency/article/000974.htm (accessed December 30, 2004).